MEXICO, NY – In recognition of October being Domestic Violence Awareness Month, employees from the Oswego County Department of Social Services dressed in purple on October 18 for National Wear Purple Day to raise awareness of domestic violence and support the efforts of Oswego County Opportunities Services to Aid Families program. 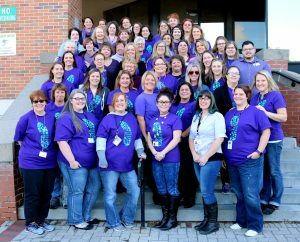 Employees of the Oswego County Department of Social Services and Oswego County Opportunities SAF Program recognized “Wear Purple Day” by wearing purple to raise awareness of, and honor the survivors of, domestic violence in Oswego County. DSS employees put on their purple and were able to wear jeans to work by making a donation to the SAF Program. Staff at DSS raised a total of $311. The goal of SAF is to raise awareness of the epidemic of domestic and sexual violence and to educate individuals on the impact of violence and abuse in our communities. SAF has provided crisis, supportive, advocacy and educational services throughout Oswego County for more than 30 years. Guglielmo also said the money donated to SAF will be used to help clients pay for process servers, documentation, such as birth certificates, and for emergent needs that come up. If you or someone you know is a victim or survivor of domestic violence, dating violence, sexual violence or stalking, call the Crisis Hotline at (315) 342-1600. The hotline is available 24 hours a day and is free and confidential. A private, non-profit agency, OCO’s many programs touch the lives of approximately 20,000 Oswego County residents each year. One of Oswego County’s largest employers, OCO employs nearly 600 people and boasts a volunteer force of 1,200. Now you know … it’s OCO!